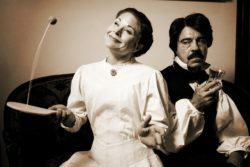 Our production of Joseph McDonough’s Edgar & Emily may be a complete fantasy, what has been called a comic fantasia, but the play’s subjects were quite real. Edgar Allan Poe and Emily Dickinson never met, and Dickinson didn’t even really begin writing most of her now-famous poems until well after Poe’s death so there was never really a possible time for such a “meeting of the minds.” McDonough offers that the appeal of putting these two figures in a room was just too great to be bound by reality. He notes that even though they were widely regarded as very different kinds of people and writers that both suffered from incorrect public perceptions and that they “shared similar concerns regarding living, dying, and finding one’s try artistic self.” Enter a little “imagination and artistic license” and voila! We have Edgar & Emily, a show that is sure to delight. We offer a little bit of background on both characters in the event you want a refresher of what you might have learned in history or lit classes or perhaps to learn more for the first time about these two fascinating 19th century American greats. To learn more about the play, our production, the style, why we chose it, and why we think this show is for you please make sure to visit this page. Edgar Poe (1809-1849) was born in Boston, Massachusetts on January 19th, 1809 to the touring actors Elizabeth Arnold Hopkins and David Poe, the second of three children born to this brief marriage. Little is known about David Poe except for his reputation for heavy drinking and erratic behavior. In December 1811, Elizabeth Poe died following an illness in Richmond, Virginia. Either shortly before or after his wife’s death, David Poe abandoned the family, leaving his three young children effectively orphaned. All three were taken in by different foster families, Edgar by John Allan, a wealthy Richmond tobacco merchant, and his wife Frances. Mrs. Allan had longed for a child, and proved to be a doting mother to young Edgar, even as her husband was a somewhat stern and severe father. Still, he had Edgar re-baptized Edgar Allan Poe (though they never officially adopted), and provided the boy with a first-rate education, first in England, where the family lived from 1815-20, then again in Richmond. The highly imaginative Edgar was often at the top of his class, especially in literature, languages and art. He was also an excellent athlete, making a six mile swim against the current of the James River at age 15. At age 17, Edgar enrolled at the University of Virginia, recently founded by Thomas Jefferson, where as a freshman he studied Latin and poetry, and did some acting as well. Edgar had a difficult time adjusting to the independence of college life. Mr. Allan provided him with very little money on which to maintain the lifestyle of a young Southern gentleman. Although Edgar did very well in his courses, he was far less successful at his classmates’ major pastime, gambling. Having lost the little money he had, his continued attempts to recoup it only threw him further into debt. As his difficulties mounted, Poe began to turn to alcohol to escape the pressures on him. When Poe’s debts were revealed, a furious Allan cut off the boy’s funds, removed him from the university and forced him to return to Richmond. Tensions between Edgar and John Allan came to a head as Frances Allan lay dying of tuberculosis, no longer able to protect her foster son. Poe had been courting his childhood sweetheart, Sarah Elmyra Royster, but his debts and drinking had become public knowledge, and the girl’s parents insisted that she marry someone more suitable. Devastated and fleeing his creditors, Poe moved to Boston, where in 1827 he anonymously published his first and now-rare book of poetry, a thin pamphlet entitled Tamerlane and Other Poems. Shortly thereafter, Poe joined the U.S. Army under the pseudonym Edgar A Perry. In just a year and half, he rose to Sergeant-Major, the highest possible non-commissioned rank. Having been honorably discharged in April 1829, Poe moved to Baltimore to live with his aunt, Maria Poe Clemm, her 7-year old daughter Virginia, and his own brother William Henry Poe, who was then himself dying of tuberculosis at age 22. That year he published his second book of poetry, Al Aaraaf, Tamerlane, and Minor Poems. In 1830, Poe received an appointment from the U.S. military to attend West Point; but within months he became disillusioned with the rigid academy, and got himself dismissed in March 1831, returning to his aunt’s home and devoting himself to his writing. In 1834, John Allan died, leaving bequests even to his illegitimate children, but making no mention of Edgar. Meanwhile, however, Poe was having his stories and poems published in several magazines, and was slowly approaching financial stability. In 1835, he was hired as an associate editor of Richmond’s Southern Literary Messenger. With the departure of his cousin Henry Clemm to sea, Poe’s aunt and cousin Virginia were left without a male breadwinner. In 1836, Poe brought Virginia and his aunt to Richmond, where he married Virginia (then 13), ensuring that both women would have a more secure living situation. Over the next several years, Poe and his family moved between Richmond, New York and Philadelphia as he tried to establish his literary and editorial career with a major magazine. Between the years of 1839 and 1841, Edgar was published by Burton’s Gentleman’s Magazine, Graham’s Magazine, Godey’s Lady’s Book, and the Evening Mirror. One of his most renowned stories, The Fall of the House of Usher, was released in the book Tales of the Grotesque and Arabesque in 1840; the following year, what is now hailed as the first modern detective story, The Murders in the Rue Morgue, was published. The character C. Auguste Dupin is clearly the prototype for the likes of Sherlock Holmes and Hercule Poirot. Between 1842 and 1844, when Edgar and Virginia officially settled in New York City, stories such as The Pit and the Pendulum and The Tell-Tale Heart were published. 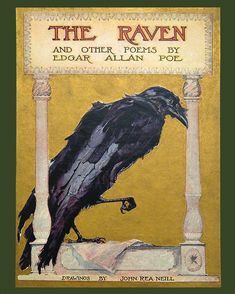 In 1845 Edgar received international acclaim with the release of The Raven and Other Poems. His success was overshadowed, however, by further personal tragedy. In 1842, Virginia ruptured a blood vessel while singing, an early sign that she too was succumbing to tuberculosis. As her bouts of illness increased, Poe again turned to alcohol for relief. Despite his growing acclaim, the couple’s financial situation was still precarious. In the era before copyright and royalties, even “The Raven” earned Poe just 14 dollars. Poe frequently found himself unable even to keep their cottage heated. In January 1847, Virginia died at home, with Edgar at her bedside. The poem Annabel Lee is likely inspired by her. Alone again, Poe succumbed fully to his alcoholism and depression— drinking far more often and falling into a completely altered state with even the smallest amount of alcohol. In little more than two years, he would die in Baltimore under mysterious circumstances (see next page). Often considered something of a curiosity in his own time, today Edgar Allan Poe is accounted one of the greatest American writers, and a father of three new genres: horror, science fiction and the murder mystery. In his own life, he earned wide admiration and acclaim from his literary peers around the world, including Dostoyevsky, Baudelaire, Walt Whitman, Charles Dickens and many others. The cause of Poe’s death is still a mystery to this day. 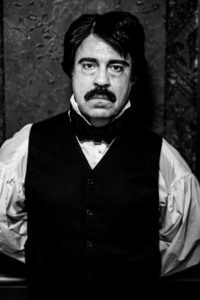 A mean-spirited adversary (who Poe had previously given a bad literary review to) wrote an obituary that continues to color modern perception, but some modern scholars believe that he may have in fact died of brain cancer. Emily Dickinson (1830-1886) is considered one of the most famous poets in the history of American literature. Though socially shy, she was outspoken and emotional in her lyric poetry (short poems with one speaker who expresses thought and feeling), defying the nineteenth-century expectation that women were to be demure and obedient to men. 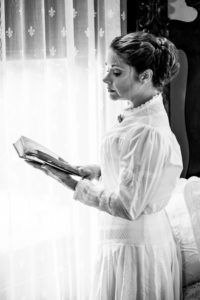 Her honest and uninhibited writing made her an early feminist voice, even as she maintained an outward appearance of submissiveness. Nearly two centuries after Dickinson’s birth, her witty and frequently subversive poems are widely read, taught, and studied. Dickinson was born in Amherst, Massachusetts, to a prominent family. 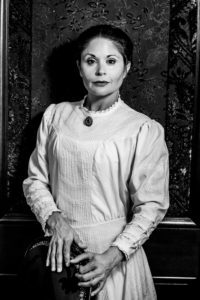 Her Victorian upbringing included socializing with friends, doing domestic chores, and attending church. She spent her adolescent years studying locally at the Amherst Academy (1834–47) and at the Mount Holyoke Seminary (1847–48). Beginning at age 23, however, Dickinson began to withdraw from society and by the age of thirty, she became a relative recluse, spending most of her days indoors. She did not cut off her contact with others entirely, as she received certain guests, traveled within New England to visit relatives, and wrote letters to friends and family, most often her sister-in-law and closest friend, Susan Huntington Gilbert, with whom she often discussed her poetry. Dickinson’s seclusion allowed her to focus on developing her poetry. Her poems addressed emotional and psychological states such as loneliness, pain, happiness, and ecstasy; death, often personified; religion and morality; as well as love and love lost. Dickinson’s poems have had a remarkable influence in American literature. Using original wordplay, unexpected rhymes, and abrupt line breaks, she bends literary conventions, demonstrating a deep and respectful understanding of formal poetic structure even as she seems to defy its restrictions. Among her poetic devices were dashes used as a pause and capitalization for emphasis. Just as Dickinson straddles a fine line between religious loyalty and dissent in her highly spiritual poems, her poetic structure finds a similar middle ground between the acceptance and rejection of established forms. Although she was a prolific writer, the world would not realize Dickinson’s true artistic talent until after her death. She published only seven poems in her lifetime including her now well known Safe in their Alabaster Chambers, in the Springfield Daily Republican in 1862. After her death in 1886, her sister Lavinia uncovered some 1,800 of Dickinson’s poems bound with thread into numerous booklets. In 1890, 1891, and later in 1896, the poems were heavily edited, with regularized punctuation and capitalization, and published in three volumes Poems; Poems: Second Series; and Poems: Third Series, by Mabel Loomis Todd and Thomas Wentworth Higginson, a literary critic who Dickinson previously sought advice from. The works were very popular, and the full extent of Dickinson’s genius was finally revealed. Martha Dickinson Bianchi, Dickinson’s niece, published additional poems, including the collection Bolts of Melody, in 1945. In 1955, another edition, The Poems of Emily Dickinson, was published by Thomas H. Johnson as a more complete and accurate text, closer to Dickinson’s originals. It was not until 1998 that a complete volume would publish using her original style. Although Dickinson’s death certificate says that she died from Bright’s disease (a common denomination for a kidney ailment), recent research into her symptoms and medication indicates that she may actually have suffered from severe primary hypertension (high blood pressure), which could have led to heart failure or a brain hemorrhage. Edgar & Emily teaser 1 from Jobsite Theater on Vimeo. It’s a myth that Dickinson only ever wore white. A photo and several accounts of her clothing in her own writing prove otherwise. Emily had a HUGE green thumb IRL. She grew hundreds of flowers, planted vegetables, and cared for apple, cherry, and pear trees. She also oversaw the family’s greenhouse, which contained jasmine, gardenias, carnations, and ferns, and she often referred to plants in her poetry. The gardens at her home have been restored to the way they were when she was alive. She also really suffered eye problems in her 30s, when the play takes place. Today folks think that it was iritis. During this period she wrote in very low light using a pencil. Though he never really met Emily Dickinson, Charles Dickens and Poe were pen friends and even met once in Philadelphia when Poe was 34 and Dickens was 31. Edgar & Emily is on stage at the Straz Center for the Performing Arts Oct. 10 – Nov. 4. Amazing performances by both Edgar and Emily! Would love to see it again. Paul Potenza as Edgar and Katrina Stevenson as Emily developed their characters beautifully, making 90 minutes just fly by! Kudos to David Jenkins and Jobsite. My friend and I try to see as many Jobsite productions as possible, and this was one of the very best. The characters were beautifully cast, and the gestures of the couple were so effective, at times you didn’t need words. Thanks for a wonderful evening.